When South Carolina native Nancy Meckstroth retired from her construction industry business she decided to start a new life in a whole new location. 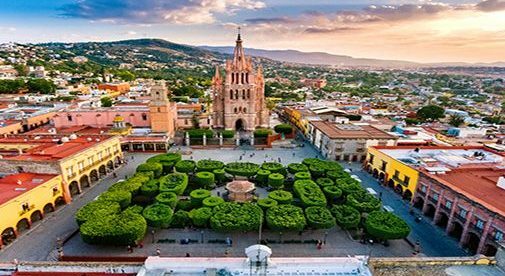 The Mexican Colonial Highlands town of San Miguel de Allende was the clear choice due to active expat community, ideal climate, and vibrant Mexican culture. Nancy lives in Colonia Independencia, which is just outside of the well-preserved historic centro with its grand colonial architecture and well-kept plazas and parks…and a legacy going back to the 15th century. “I really wanted to live in Guadalupe where my sister lives,” says Nancy, referring to another neighborhood in town popular with expats. At first Nancy thought all the place needed was a paint job and a few minor repairs. But she soon realized she wanted to make some bigger improvements. By buying in the Independencia neighborhood, where homes are less expensive than closer to the center, she now has money for the renovations. Nancy’s plan was to extend the living room and also use the garage (she doesn’t have a car) to make the interior courtyard bigger. That’s just the start. “I wanted to change out the tile in two of the three bathrooms. And that’s not an easy job. It involves hammering out the tile by hand. I’ve had a rooftop terrace added. The kitchen had concrete counters and sink. We had to beat out the sink and put in a stainless steel sink,” says Nancy. “In the master bathroom you had to walk up a couple of steps and walk down couple steps to get into the tub. And there were floor-length windows exposed to the neighborhood. I wanted to change that. To pick out tile and other materials, Nancy goes with the head contractor to local hardware stores, as well as artisan shops. Dolores Hidalgo is about 45 minutes drive away and is famous for its brilliantly and intricately patterned tile. “I’ll pick out the light fixtures, too. It’s not expensive because it’s the Mexican style I like. I’ll also be out and see something I like and just buy it. For faucets, the plumber/electrician and I went and chose them,” says Nancy. “I just bought a coffee table the last time we went to Dolores Hidalgo. We stopped at this one place in on the side of the road. The guy makes his own furniture. I bought a mesquite coffee table for $150. I’m going back to his place tomorrow.